Earth friendly BT (Bacilus thuriengensis). 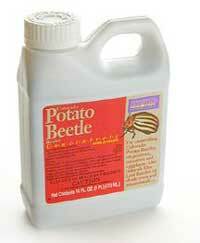 Naturally controls Colorado Potato Beetle larvae as well as selected leaf beetle larvae and adults. Improved formula. See the file “Using BT” for details about effectively using this product. This product is available in independent garden centers.